Each year numerous scaffold accidents take place in New York involving construction workers or passersby and resulting in injury or death. 16 million for an asbestos handler who fell from a scaffold while demolishing a Pepsi Plant in Long Islands. $6.25 million verdict for a worker who fracture his pelvis and his left.elbow after falling from a rope scaffold that wasn't properly secured. $5.8 million for a construction worker who fell from a scaffold after it was struck by a Hi-Lo. $2.95 million for the estate of a single woman who died after a scaffold fell on her. $2.5 million for a Queens carpenter who suffered back injury after falling from a rolling bakers scaffold. $1.15 million for a painter who suffered a calcaneal fracture after falling from an unsecured bakers scaffold. Steel scaffolds are more durable than wood structures. Steel scaffolding must be erected and used in accordance with the manufacturer's recommendations. Proper seating and locking of all scaffold connections is mandatory. Firm footing must be provided for each upright; a metal plate is most satisfactory and may be provided with scaffolding. It is necessary to supplement this plate with planking or other support in loose material; minimum thickness of lumber recommended is two inches. Scaffold footings should be secured against movement by recessing, staking, or other means. All uprights must be plumb. For a scaffold less than 75 feet high, a minimum outside diameter of 2 inches is recommended for tubing. For scaffolds above this height, the uprights should be in accordance with manufacturer's recommendations. Toe boards are normally nailed to uprights when erecting a wood pole scaffold. Because tubular scaffold uprights are metal, toe- boards must be nailed to platform planks or fastened to uprights with bolts or other appropriate connections. Guard rails must be secured to uprights by connectors designed for this use. Guard rails for tubular scaffolds should have tubing with a minimum outside diameter of 11/2 inches. The most frequent misuse of tubular scaffolds is the failure to use toe boards and guard rails. Tubular scaffold uprights are usually smaller in diameter than timber posts for the same size scaffold. It is important that: (1) uprights be erected and maintained in vertical (plumb) position, and (2) diagonal bracing be provided. Exterior scaffolds should be tied or anchored to the building at a height of 3 times the narrowest width and every two sections thereafter as a minimum. As work progresses upward and platforms are removed, it is important that all ledgers be left in place to provide rigidity. Workmen must not ride rolling scaffolds or attempt to move rolling scaffolds by pulling on overhead pipes or structures. All material and equipment should be removed from the scaffold platform or secured before moving the scaffold. Caster brakes or wheel locks should be applied at all times when a scaffold is not being moved. All lumber used in constructing ramps, platforms, and scaffolding, should be of good quality, seasoned, and straight-grained, free of large loose or dead knots, knots in groups, checks, splits, and other defects which decrease the structural strength. All nails should be driven home. No nail should be subjected to direct pull. A minimum of four nails per joint should be used. The size of the nail used depends upon the load that must be carried by the joint and the thickness of the material being jointed: one-inch stock requiring 8d nails, two-inch stock requiring 16d nails, etc. Each scaffold should be designed for the loads which will be done in the performance of the work. All loads, including workmen, building materials, and the weight of the scaffold structure itself must be taken into account. Adequate footings, such as planks, should be provided for up rights, especially when they rest on earth, sand, or loose material. Cross-bracing to provide stability for the scaffold must be provided. Permanent ladders or stairs should be provided. If a ladder is used, it should be secured against slipping and overturning. Over head protection must be provided for workers on the scaffold if work is being performed overhead. A roof of lumber, heavy canvas, or screen wire can be used. Handrails and guardrails should be provided on all open sides of scaffold platforms. Toe boards should be installed on all open sides of scaffold platforms. Pole scaffolds have been classified as "light trades" and "heavy trades". The former includes carpenters, painters, and other trades which will not bring heavy material loads on the scaffold platform. The "heavy trades" include bricklayers, stonemasons, concrete workers, and steel workers. Single pole scaffolds differ from independent scaffolds in that only one side is supported by uprights, one end of each ledger being carried by the building under construction itself. Single pole scaffolds should be cross-braced in both directions, along the face of the building and at right angles to the building face at every third or fourth upright. All scaffold structures should be inspected at least daily by the project manager, project engineer, or other responsible person designated by the job superintendent. No change of any kind should be made to a scaffold without approval. The scaffold should be cleared of all debris daily. No tools should be left on a scaffold overnight. Scaffold structures should be protected from trucks and other vehicles which might come into contact with them. Working platforms of the scaffold should be free of ice, snow, oil, and other slippery substances before being used. 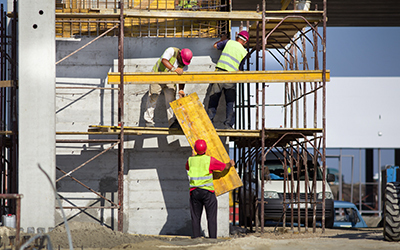 If you have suffered a serious personal injury or a loved one died as a result of a scaffold accident, please Contact a New York scaffold accident attorney to discuss your case.